When Android moved up from version 4.3 to version 4.4, the dessert name switched for Jelly Bean to KitKat. I was fortunate enough to receive this KitKat 4.4 update to my Nexus 4 phone. Besides the dessert name, a lot has changed here and there between these two OS versions. New features have been introduced to Nexus 4 with this new Android KitKat 4.4. Those changes are not noticed outright because the changes relate more to performance than to cosmetics. There are no major changes in the launcher which would have been quite noticeable. The new changes that I can find are generally in the settings menu area, lock screen and some cosmetic changes. Some changes can be seen in the stock apps as well. I am trying to list those new changes that I manage to notice in my phone. Remember how new versions of Android have the ability of adding widgets in the lock screen? That feature is there but is sort of hidden. Previously, we could scroll left and right at the lock screen. At the right of the lock screen was the camera app by default. While this remains, the main page of the lock screen has a small camera icon in the bottom-left. mainly, it helps those users who did not know about this feature, easily access it. We can't scroll to the left of the lock screen by default. Colors of several menu items and settings have been changed. The colors on the settings bar on top has been changed, for example. The settings menu colors like those used for wifi and phone signals look a bit different. I am not that great in noticing or recognizing colors, so I can't say for sure color switched to which. Icons for several apps such as dialer and camera look quite different now. The phone dialer has been completely changed. It is now a search powered dialer, which displays the name or rather tries to guess the name right on top of the dialer. 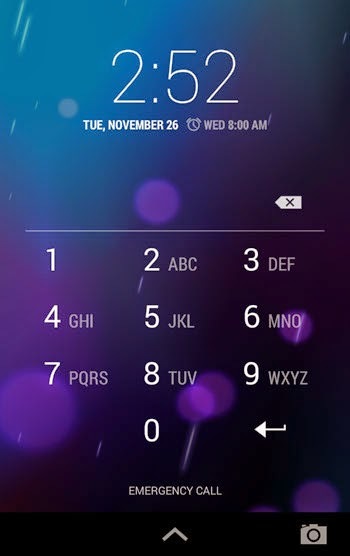 The numerical dialer only takes the bottom area of the screen. As you dial numbers, matching names are displayed on top. 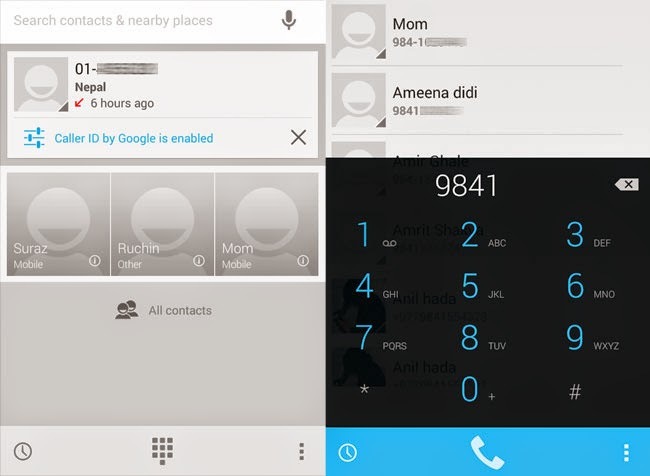 Recent calls and frequently called contacts are also displayed right in the first screen of the dialer. Previously, we had to switch tabs for this. You also get a feature called caller ID by Google. This feature is turned on by default. This feature allows your phone to display the business name for numbers that you do not recognize. Numbers which are registered to a certain business are now recognized. You will know which businesses and organizations are calling you, even if you do not have their numbers saved in your phone. You can also search for those businesses on the dialer and call them. The phone settings has additional items available. The title bar that says "Settings" on top looks different. There is an option for "Tap & pay" which allows you to "Pay with just a tap". There is also an option for "Printing" which adds native support for cloud printing. In the "Wireless & Networks" page of settings, we can see that there is an option to choose a "Default SMS app". Under the Phone Settings > Developer Options (See: How to Enable/Disable Developer Option in Nexus 4), there are some new options. The most interesting one is the applications runtime. You will see an option to choose between Dalvik and ART. You will have to reboot your phone to change this option. All the apps will be optimized during the restart and it takes time. People say that ART is faster than Dalvik because it compiles the code beforehand but takes some additional storage space. Try them both and use the one that you think is making your apps load faster. Changes can also be seen in the clock app. The interface is a bit different. When you try to change or set an alarm, the way you set it is sort of different. You drag the pointer through a clock and set the time. You can also set a different timezone and the time for that region will be displayed right under the clock. This means that you get to look at the time of many timezone at once. I saw two new stock apps, Play Newsstand and Play Games. I know that people have been using these apps for sometime but I saw these in my phone for the first time. May be I did not notice it in my phone or may be KitKat added it. I can also notice the changes in the sounds played when we tap on buttons. This is a minor change but is noticed quickly. Nexus 5 has some exclusive features that are not introduced in Nexus 4. The ones that I know of are: transparent status bar, default music widget on the lock screen, home screen settings, Google now placed at home screen in the left and HDR+ shooting mode for the camera.